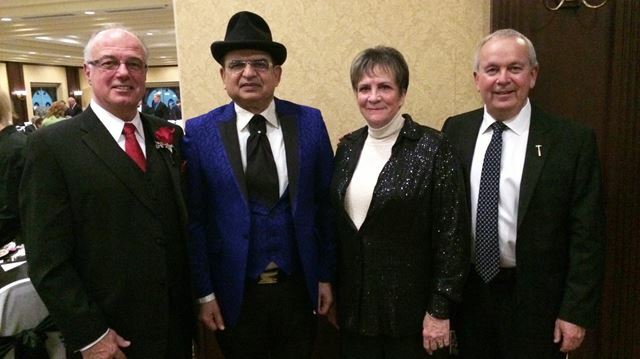 The 12th Annual Grimsby Rotary @Noon Mayor's Charity Gala was a huge success, and ended with a huge surprise! District Governor Marlee Diehl greeted everyone on behalf of Rotary, and noted that the Rotary International theme for the year is "Rotary Serving Humanity". She congratulated the small club for organizing such a big event. The ballroom at the Casablanca Inn was full, and many local supporters and businesses contributed to as sponsors and as Silent Auction donors. Mayor Bob Bentley welcomed everyone on behalf of the Town, and expressed his appreciation for the work done to make this event successful, and to make our Town better. Pat Jaskula spoke on behalf of the Grimsby Walk for Guide Dogs, the headline beneficiary of the 2016 Gala. Under her leadership, the Grimsby Walk for Guide Dogs is one of the top 10 fundraisers of all the Guide Dog Walks in Canada. The 2017 Mayor's Charity Gala headline charity is Habitat for Humanity Niagara, who is building for a 2nd time in Grimsby. Grimsby Rotaray @ Noon sponsored the first Habitat home in Grimsby, which was built on Main Street about six years ago. Last October Habitat announced a second home is being build at the corner of Central Avenue and Baker Road, on donated land from Vera Engel-Ricer and her son David Engel of Dorchester Homes. This home is now framed in, and Habitat is looking for volunteers to do interior and landscape work. Habitat -Niagara also announced they are in the process of building a Re-Store on Grimsby's South Service Road, and they are very excited to be working with the community to bring used home renovation and furnishings to the area, and will be seeking volunteers to work at the Re-Store when it opens this year. The surprise announcement of the evening was when LJM Developments CEO Liaquat Mian announced the company will be donating a condo unit in the next phase of the Waterview Condominiums project to Habitat for Humanity Niagara. Mian received a standing ovation for his announcement at the Gala. Grimsby Rotary @Noon appreciates all who attended or who supported this event in any way.